men Final for their maiden title. Led by Final Four MVP Angel McCoughtry, Dynamo Kursk were sluggish early, conceding a 10-0 lead. However, they just as quickly turned the game on its head rallying to go on a 31-11 run to put themselves in a dominant position. Fenerbahce fought back to within two points, notably with just over nine minutes remaining, however, it was ultimately a night of celebration for the Lucas Mondelo-coached Kursk side, with the play-caller taking a time-out, before a 15-0 run ensued to seal the game. McCoughtry was exemplary in both the Semi-Finals and gold medal game, scoring 28 points in her side's Friday night victory over ZVVZ USK Prague, before adding 20 in the Final. 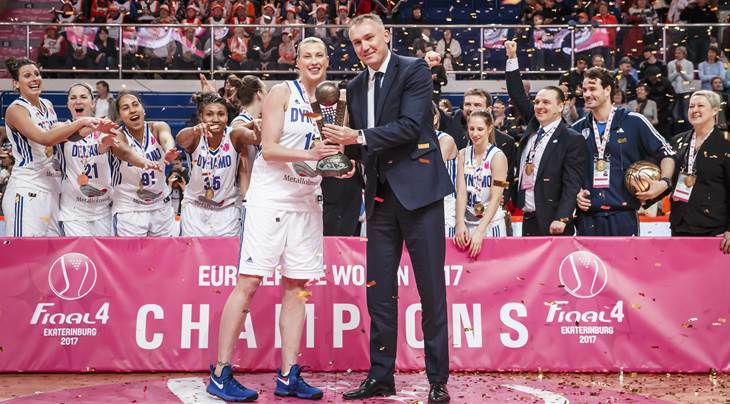 Earlier in the day, hosts and defending champions UMMC Ekaterinburg made up for the disappointment of missing out on the championship game in front of their home fans, by defeating ZVVZ USK Prague 68-63 to claim the bronze medals. The Final draws the curtain on the European women's club season, with the next major event on the European women's basketball calendar coming in Czech Republic in summer, when Prague and Hradec Kralove host FIBA EuroBasket Women 2017 from June 16-25.